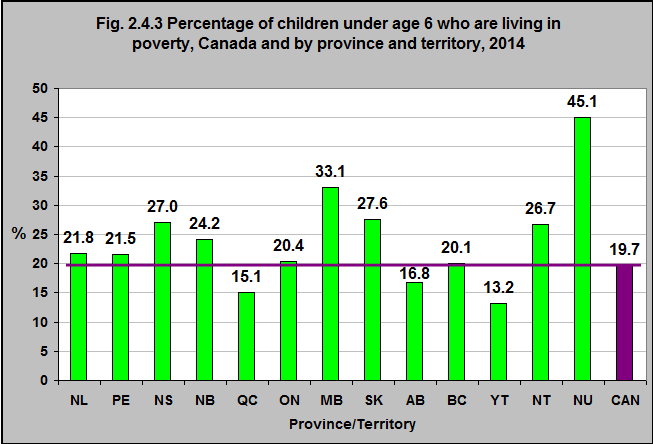 Source: CICH graphic created using data adapted from Campaign 2000 Report Card on Child & Family Poverty in Canada, 2016. A Road Map to Eradicate Family Poverty. http://campaign2000.ca/wp-content/uploads/2016/11/Campaign2000NationalReportCard2016Eng.pdf July 16, 2017. For the purposes of this module we are using the Low Income Measurement (LIM)*. In 2014, 19.7% of all children under 6 were living in poverty – or below the LIM. That proportion ranged from a low of 13.2% in the Yukon to a high of 45% in Nunavut. For an infographic that compares the LICO, LIM and Market Basket Measure click here. 1Raphael D. 2011. 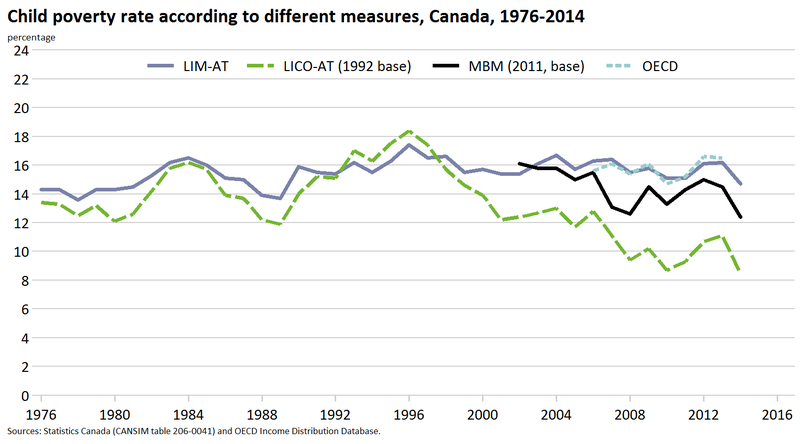 Poverty and Policy in Canada: Implications for Health and Quality of Life. 2nd Ed. Toronto: Canadian Scholars’ Press Inc. https://www.canadianscholars.ca/books/poverty-in-canada accessed July 16.